These 2 person kayaks are extreme kayaks are ideal for beginners, children, or for people who just want a recreational kayak that's easy to use. These kayaks are very good recreational or touring boats. These can be used for recreational kayaking and also as a fishing kayak. 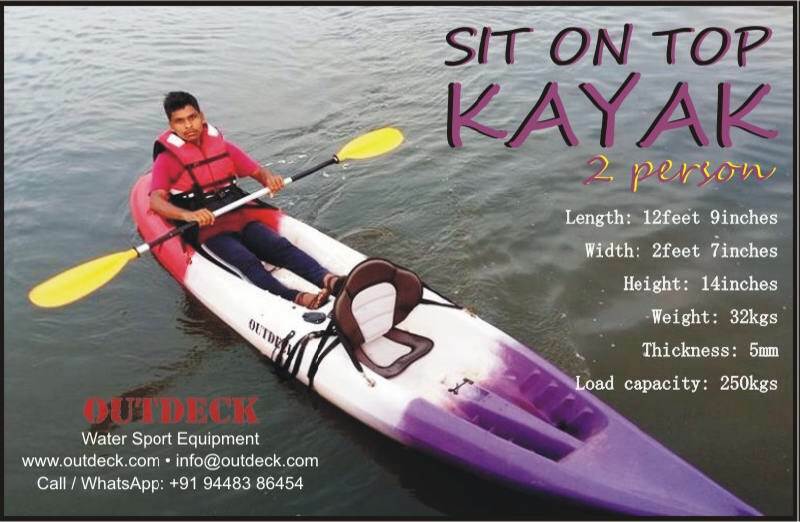 Another benefit of sit-on-top kayaks is that they are very easy to keep upright. Usually these kayaks are designed to be a bit broader than regular kayaks. The result of this is that there is more base to the kayak - which means that it's much harder for them to tip over. The Sit-on-top kayaks are made out of plastic, they are also low maintenance, light-weight, and will last you a long, long time. Always wear a Life-jacket or PFD, when kayaking. As a rule, never paddle alone or at least you should make sure that other people know where you will be kayaking.